Do you have a pending DUI case in Glendale, AZ? The penalties for a DUI conviction in Arizona are very harsh. If you’ve been suspected of DUI in Glendale then you should speak with a DUI attorney regarding your case. There are many different ways an experienced Glendale DUI lawyer can look at your case to see if there might be a way out of this for you. Our criminal defense firm has won over 1,600 DUI cases in Arizona. In doing your due diligence, please take advantage of our free consultation. You can call our offices 24 hours a day at (602) 307-0808 or send us a confidential email. Our DUI lawyers know the top DUI defense strategies and we understand the Arizona DUI laws inside and out. Our goal is to help minimize the damage a DUI conviction can bring on your entire life. A DUI conviction can carry repercussions for many years after the fact. A conviction for DUI in Arizona is something you really want to keep of your record if at all possible. One way to do this is to hire a Glendale DUI Lawyer who will not leave any stone unturned in your defense. When you hire us to represent you we guarantee we’ll do more than our competitors. We go the extra mile for our clients whether it is independent testing of blood samples, chasing down witnesses and doing interviews, or tearing apart a police officer’s report looking for any possible way out of this for you. Our motto at the DMCantor is that our legal defense is Beyond Aggressive! We pride ourselves in knowing more about the current DUI Defense strategies that work in Arizona. If you have a pending DUI case in Glendale, please give us a call so we can sit down with you and give you our professional opinion on how to defend your DUI. Call us today to schedule a Free Consultation with a Glendale DUI Lawyer who will review your case and let you know what to expect. Our offices are available 24 hours a day at (602) 307-0808 or via our confidential email form. Call (602)-307-0808 24 hours a day to Get a Free Consultation! Be sure to have a look at some of our DUI victories on our main site at dmcantor.com. Be sure to look over our Not/Guilty Complete Acquittals section as well. 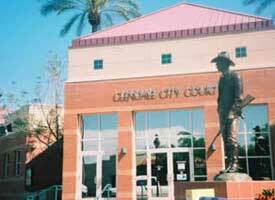 Click here to learn more about the Glendale City Court system. If you are ready for a Free Case Review by one of our DUI Attorneys, give us a call at (602) 307-0808 or send us an email by using our confidential web form and we’ll call you back as soon as we can.